Willing Suspension of Disbelief is a contract between a narrator and his audience that they will go along with pretty much any premise the storyteller gives them as long as it doesn’t strain the realms of plausibility too much. That’s not to say the narrative can’t be fantastical. It’s more about character actions and plot devices. If the plot relies on too many coincidences that are too unbelievable, the narrative loses credibility. 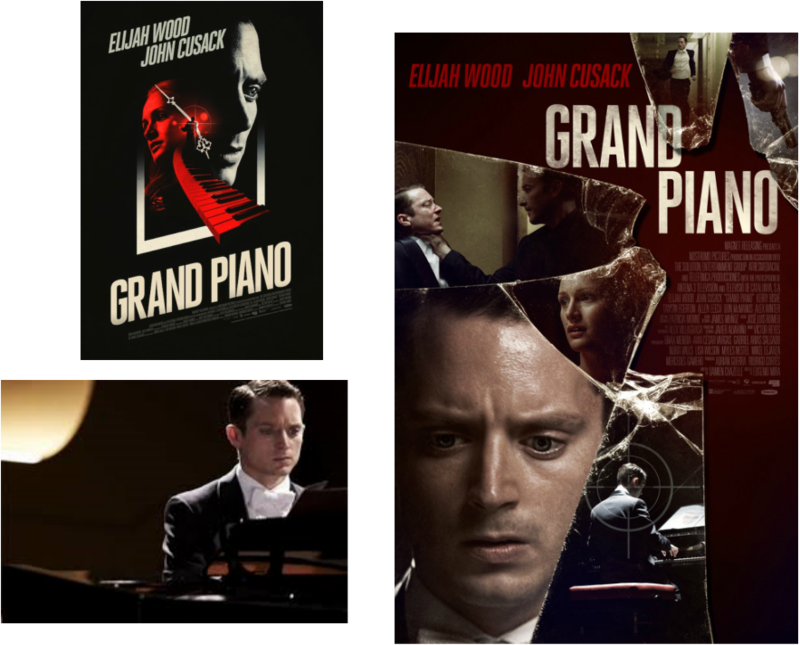 Although Grand Piano completely stretches those limits to the point of snapping like dry twigs, if you can bring yourself to ignore the ridiculous premise…it’s an enjoyable film. How do you make a movie about a guy sitting at a piano interesting? Well, let’s see…you put him in some kind of danger, right? Life-threatening danger! Or better yet, put someone he loves in danger, yeah. But we still have to watch this guy sit at a piano for 80 minutes or so. For me, that’s not really a problem, and it’s one of the reasons I enjoyed this thriller. I’m the guy who has sat through multiple viewings of Swimming to Cambodia, The Telephone, Buried, The Terror Live, and My Dinner with Andre. I haven't made it through all 5 hours 20 minutes of Warhol's Sleep, yet, though I do enjoy John Giorno's poetry! But before you think I’m raving about this movie, let’s get one thing clear…its premise is completely ridiculous, but you know…it’s not trying to be great art. It’s not trying to be an action flick. It’s not even trying to be artsy. It’s trying to entertain, and if you can check your disbelief at the box office…you’re in for a treat. I know why I like this movie. It’s not just the sum…I like the parts. Elijah Wood, I’ve always liked him, even when he’s not trekking across Middle Earth to return jewelry to its elemental resting place. Piano playing. This is basically a 90 minute classical music video (I know, reason enough for some of you to stay away). The visuals are orchestrated well to coincide with the music. I’ve watched many music movies where the actor’s attempts to actually look like he/she is playing an instrument were almost comical. Here, Wood is right up there with Adrien Brody in The Pianist, so that helps. So what’s this movie about? It’s about a virtuoso pianist who had a setback five years prior to the concert we are about to see. He suffers from stage fright and as he begins playing, he turns a page of music to reveal the message “Make a mistake and you will die” or something like that. Wood’s character thinks it’s a joke until he sees a red laser sight on his hands. What follows is the most outrageously unlikely sequence of events based on the most ridiculous motivation of any movie I’ve seen in a while. Its plot centers around a music piece he tried to play five years before which has now been dubbed “The Unplayable Piece.” Yeah, right. Don’t tell Lang Lang there’s only one man in the world who could play it! Here’s an example of what I mean by ridiculous. For the majority of the movie, Wood’s character Tom, plays and talks to his terrorist at the same time. He’s got an ear piece in (don’t ask how he got it). While many people might find that fantastical enough, I know from experience that it’s possible for a person to have learned a piece so well that they could multitask while playing it. We pianists say you get a piece “in your hands.” It’s a kind of muscle memory one needs in order to play passages so fast and with so many notes that the mind can’t think of them individually. So for me, I can accept it as possible that this guy, who’s supposed to be the best of his generation, could do this. But if that were the case, he wouldn’t need the sheet music he brings on stage with him. It would already be “in his hands”, and most professionals play from memory anyway. But hey, maybe the music is there because it’s a stage-fright-crutch thing. I could buy that, but then there comes a scene where he is not only playing with one hand, he is texting from his phone from behind the music with the other. My suspension of disbelief snapped like a postal worker on a bad Monday! In spite of many moments like this, it’s still an enjoyable thrill ride. Imagine Speed but on a piano not a bus. Oh yeah, it’s also got actor Alex Winter (aka Bill S. Prescott, Esquire…and if you don’t know who that is…you shouldn’t be reading my blog!). SO grab the popcorn and loosen up your mind and enjoy this entertaining bit of fluff and get some heavy duty cables to use to suspend that disbelief. Enjoyable movie if you don't think about it too much.